Home / Blog / Mitochondrial Burnout: Is It Inevitable as You Age? Mitochondrial Burnout: Is It Inevitable as You Age? While, like Ponce de León, we may never discover a literal fountain of youth, we may be hotter on the trail of a metaphorical one. Scientists have tapped deeper into what controls aging, putting us another step closer to our youth. The answer lies within the power supply, the battery, of our cells—the mitochondria. More specifically, the concentration of a protein called carbonic anhydrase within our mitochondria, according to a new study. This protein may be the key to mitochondria burnout as we age. To understand what this new study has found, let’s take a quick trip back to high school (without the drama) and review a bit of basic cell biology. I believe every high-school science book describes the cell as the “basic unit of life” or the “smallest unit of life” or something to that effect. Cells form tissues, tissues form organs, organs form organ systems or body systems, and those systems make up the whole human being. The human body is made up of many kinds of cells that have many different functions. An immune cell, for example, hunts down and fights body invaders (e.g., viruses and bacteria). There are also many blood cell types, such as red blood cells, megakaryocytes, macrophages, and platelets as well as the cells that make up our organs. Believe it or not, these cells have their own organs. These include the nucleus, ribosomes, the endoplasmic reticulum, the cell membrane, mitochondria, and much more. For our purposes today, we want to explore the mitochondria. Mitochondria are the batteries, the power supply, inside your cells. They create the energy that stimulates the cell’s machinery to operate by converting nutrients from food into chemical energy. But sometimes, when our cells become damaged, those mitochondrial batteries go dead or lose power. While cell damage can be caused by a variety of things, this new study looked at two things that can damage our cells: the normal process of aging and brain degeneration at an early age. The new study looked at the mitochondria of three different groups of mice, which included young mice (control group), mice with a cell degeneration in the brain (neurodegeneration group), and old mice (aging group). The study results showed that the amount of a specific protein—carbonic anhydrase— in the degeneration and old mice groups was significantly decreased in comparison to the young mice group. In addition, the study looked at specific regions of the brain and determined that “mitochondrial impairment can be a region specific phenomenon in disease, but in aging appears to affect the entire brain,” meaning while degenerative disease may affect only one part of the brain, aging affects the whole brain. This was an animal study, so, of course, the research needs to continue in a human population, but it’s interesting nonetheless. Does this all mean we just grin and bear it as we age? Sit by idly as our mitochondria burn out and die because “it’s all just a normal part of aging”? Is there anything we can do when our cell batteries start dying off or go dead? Yes. The same thing you do with your smartphone of course: recharge those cell batteries. A number of different studies have shown that mesenchymal stem cells can help damaged cells by transferring their good mitochondrial batteries to the damaged cell. The stem cell will find the damaged cell with the bad battery; latch to it; and transfer the good batteries, the good mitochondria, into the bad cell, replacing its batteries and repairing and rejuvenating the cell. Isn’t the human body amazing!? Watch this brief video for a visual of this process. 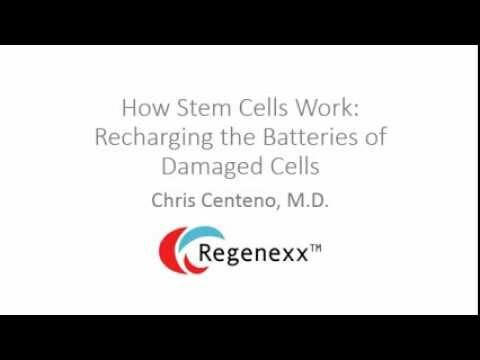 Last year I blogged about how your body can sort these stem cell batteries as well. In other words, it can sort the bad from the good mitochondria in stem cells. The study I shared showed that when the cells divide and grow more copies, the body tends to sort the good batteries into one cell and bad batteries into another rather than proportioning them equally. It appears the body prefers a smaller supply of strong, healthy stem cells with good batteries over than a bunch of mediocre stem cells with a combination of both, perhaps as a way of attempting to combat its own aging process. Perhaps the best-studied supplement that may help mitochondria is CoQ10 (Coenzyme Q10). This enzymatic assistance molecule helps the fuel of mitochondria work better. So what evidence is there that this stuff will help you? In this study, CoQ10 was shown to help the mitochondrial damage that cholesterol-lowering drugs can cause. CoQ10 has been shown to help heart-failure patients, and the theory about why that works is that it helps the old and worn-out mitochondria in heart-muscle cells work better. Finally, in this study, CoQ10 helped the effects of aging in mice. What’s the right CoQ10 dose? Usually, 50–300 mg is recommended. The higher doses are recommended to assist with energy levels in exercise. The upshot? Humans will forever seek that fountain of youth, and while finding a magical fountain is unlikely, new studies like this continue to give me hope that someday we will discover regenerative ways to combat mitochondrial burnout and keep ourselves youthful and healthy as we age. What is your comment regarding the Elysium supplement? No real opinion as of yet. Have heard buzz about something called NAD+ these days which seems to suggest some sort of similarly beneficial effect re: "mitochondrial re-charging". Any thoughts there? Have heard of it, no real opinion as of yet. What about Niagen (NAD+)? It's supposed to clear out the dead mitochondria that clogs up the systems, while reviving/regrowing the aging ones. Thanks for the good info as usual. Your position is consistent with what I've been reading; that keeping Insulin levels down and preventing blood glucose from continually spiking ( via the elimination of sugars and leaning more toward nutritional ketosis) along with intermittent fasting promotes a type of metabolic stress that encourages autophagy within many cells and specifically mytophagy in the mitochondria.